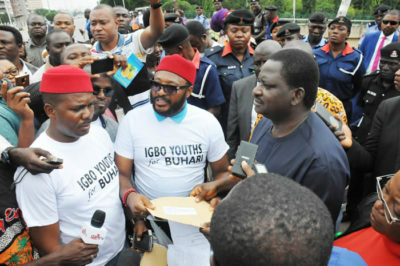 The Coalition of South-East youths on Tuesday held a rally in support of President Muhammadu Buhari in Abuja. Jude Unegbu Actualy they are the coalation of south east preginant men residing in abuja,i pity them with that their bad big belley,may the god of hausa fulani give them purging herb so that they will purge for 3 months non stop,iseeeee!!!!!. Izuchukwu Banks Dear APC, stop wasting funds on childish propaganda; there are lots of work to do and more important things to spend money on and better the people’s life. 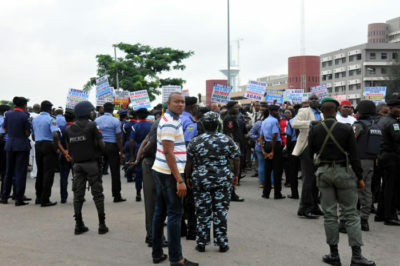 Chijioke Nobert Mumus, see their bellies like that of toad over filled with water. 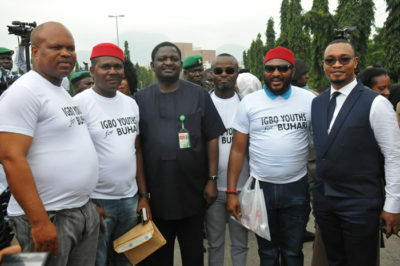 Mark Henry Mark These Matured Youth has term Nnamdi Kanu as a first class criminal, imbecile & a tantrum, with this inscription on their shirt am sure the Idiot Igbos here will be ranting insult on them because the wise ones separated themselves from the fools, dumbers, deluded minds and the Nincampoop. Goodnight Biafra.